It is very difficult to understand and comprehend that people living with Alzheimer's or a related dementia are deeply forgetful. The Holiday's can be a very difficult time for Alzheimer's caregivers. Instead of being happy we often end up sad on Christmas or Hanukkah. The thing is we actually get to choose between happiness or sadness. During the first few years instead of Christmas being a happy day for me and my mom it turned into a day of sadness. I would go to great lengths to get my mom a bunch of small presents and wrap them up. A watch, a bracelet, earrings, and some nice cloths. Then much to my chagrin she showed very little reaction while opening them. This hurt my heart. After a few years I finally realized it was not about me - it was about my mom. It was up to me to find a way to make it a good time for her, not the other way around. After I found my way into Alzheimer's World I realized that my mom was deeply forgetful. She just didn't know it was Christmas. She forgot. She was nothing more than deeply forgetful. I decided it was up to me to find a way to make Christmas day, and the Christmas season meaningful to her. The result - my heart stop hurting. Here are some of the things I did to change the situation from sadness to joy. 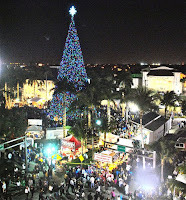 I would take my mother downtown to see the 100 foot tall Christmas tree we have every year in Delray Beach, Fl (see the image above). See would be mesmerized by the size of the tree. I guess you could say, she just couldn't believe her eyes. In addition, I would take her for a ride on the old carousel that is adjacent to the tree. Another great thing we would do is ride around in the car and look at Christmas lights. I learned after a while that is was a good idea to get out of the car and let Dotty get a good look at the houses she liked. Lo and behold people would come up to us and start talking to Dotty. She would actually turn into a well socialized person - proving conclusively that people living with Alzheimer's are perfectly capable of socializing and they like to do it. 2. I Learned How to Buy Christmas Gifts that Dotty Liked. I had to think about it for a while, but my mom, Dotty, really like those stuffed animals that sing and dance. You know the kind where you press a button on their hand or foot and they spring into action. The best one ever was bought by my sister, Joanne. It was Snoopy dressed up as Santa Claus. Not only did Snoopy sing a Christmas song, he danced. Well really he kinda shook and moved around a bit. I wrapped it back up each and every year and mom never seemed to notice. We did use it all year round and she loved it every time. Around November I would put it away for a while. Find something that sings and dances and then let me know. It should be a hit. I will suggest that you purchase the greatest Christmas gift of them all if you have not already done. Pete the Repeat Parrot. Here are 2 good stories about the parrot. The Best Alzheimer's Caregiver Tool of Them All, Harvey; and, this wonderful story by Pamela Kelly that shows that even those of you that don't think it will work might just be wrong: Worth A Try – Surprises Await -- Does the Parrot Work? Also, baby dolls work like a champ. I finally learned that cooking and cooking and cooking all day long to make a feast for Christmas was an exercise in futility when it came to mom. So I asked myself what does she like to eat most, and what will make her happy? There were 2 answers for this question. Philly Cheese steak and Linguine with while clam sauce. Well our favorite Italian place was not open on Christmas day. But our favorite cheese steak place was - so away we went. We also visited the giant Ginger Bread House downtown. Imagine a real 1,400 pound Ginger Bread House. And yes it mesmerized Dotty. Sadly, we don't have that anymore here in Delray Beach; but, what we do have is the Gingerbread House Decorating contest on December 21. If Dotty was still with us, we would have to check that out. If you are going out, turn it into an adventure. Do you complain you never go out? I did. Then I finally realized that I could live my life if I helped Dotty to live her life. You actually start meeting interesting people when you get out in the world. Don't worry they will come to you - or I should say the person that is deeply forgetful. 4. Okay Let's Get Down to the Basics. Person living with dementia are Deeply Forgetful. Nothing more, nothing less. They are still capable of having fun. It is up to you identify what it is they like to do. The deeply forgetful are still capable of being mesmerized. Go find a giant tree. And let them look at it. Take them out and let them look at the clouds (Dotty thought the clouds looked like dogs every single time - go figure - maybe she was trying to tell me she wanted a dog?). What food makes a person who is deeply forgetful happy? One thing for sure - ice cream. Go get some ice caream and turn the entire trip into an adventure. What flavor? Dotty liked every flavor. Once you start to understand that a person living with dementia is forgetful you might just get into a mode of helping them and not making it about you and how you feel when they can't remember something. It really is about what you can do to help them feel happy and attached to the world. You might start by asking yourself: who, what, when, where, why and how. 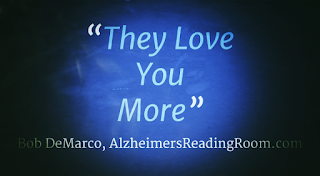 Perhaps you are thinking or feeling that a person living with Alzheimer's or a related dementia - a person who is deeply forgetful - is no longer capable of loving you. I think you are wrong. Here is why. When you go out, or you are away from you loved one - do they constantly ask where you are? Do they get angry if you leave them alone - that is an expression of emotion isn't it?